After pulling Day Break from the ABC primetime schedule in December, the network said that it would release the remaining seven episodes online. Fans were shocked by the cancellation and then enraged when the episodes didn’t appear on the ABC website (reportedly due to online music rights issues). Then, to add fuel to the fire, the Day Break page was removed for the network site. Last week, ABC Entertainment President Stephen McPhearson announced that the remaining episodes would be released by late February at the latest. It now appears Day Break fans finally have a pleasant surprise. ABC has now said that the previously aired episodes, as well as three new episodes will be streamed from ABC.com starting January 29th. A new episode will then be posted each Monday afterwards until all 13 episodes in the series have been released online. The series finale will be available on February 19th. It’s unclear if older episodes will be pulled as the new ones are made available (as NBC did with Kidnapped). If, for whatever reason, you can’t view these Day Break episodes online and/or you’d like to see Detective Hopper’s story continue past the single season of Day Break, stop by our online petition and sign it. We’ll be sending it off to the network, production companies and Taye Diggs soon. Stay tuned! Never saw this appear on DVD, and my internet connection was incapable of downloading the episodes… We loved this show. 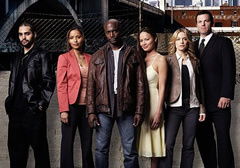 Probably not much chance of the series being revived since the stars have gone off to other projects… but it sure would be nice if ABC would air the full season 1 in light of the writers strike. This show should be given another opportunity to air; the story was interesting and caught my attention off the bat. I really don’t watch TV due to the lack of (worth while) shows o. However, this one was out of the ordinary,and I would like to see more of it. FYI, for those who haven’t found out, the whole series (including finale) has been available online since Mar 2nd. Now to just await an official DVD release. The series finale of day break is on the abc site now, it will be on a torrent and ready to be downloaded soon, I will say 24 hrs.